On August 22nd, 2001, when Typhoon T0111 was near the Izu Peninsula, about 200 km southwest of the radar site, line-type precipitation systems were formed and developed in the Kanto Plain where the X-band polarimetric radar was located. The figures on the left and right show rain rate distributions estimated by Z-R relationship and Kdp-R relationship, respectively, where Z the radar reflectivity factor, R the rain rate, and Kdp the specific differential phase. It is clearly seen that the rain rate of the line-type precipitation in the northwest regions, 25 km to 40 km from the radar site estimated by Z-R relation is much smaller than that estimated by Kdp-R relationship: the rain rate estimated by Z-R relationship is 20 mm/h while the rain rate estimated by Kdp-R is about 100 mm/h. This is due to heavy rainfall attenuation in Z by the strong precipitation system located about 10 km west of the radar site. This result demonstrates that Kdp is a key polarimetric parameter for radar-based quantitative precipitation estimates. 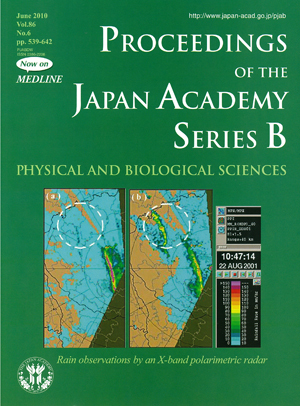 In 2009, the Ministry of Land, Infrastructure, Transport and Tourism decided to deploy operational X-band polarimetric radar networks in three major metropolitan areas (Tokyo, Nagoya, and Osaka) and seven major local cities in Japan to monitor the occurrence of localized heavy rainfall. The radar networks in the major metropolitan areas, which have been in operation since April 2010, provide rainfall information with spatial resolutions of 250-500 m at time intervals of one minute. A review article by Drs. Okamura and Oguchi in this issue (pp. 539-562) discusses various polarization-dependent rain effects including the above-mentioned improvements in R estimates.